Good evening scrappers, I'm new to the forum and have been scrapping for less than a year. 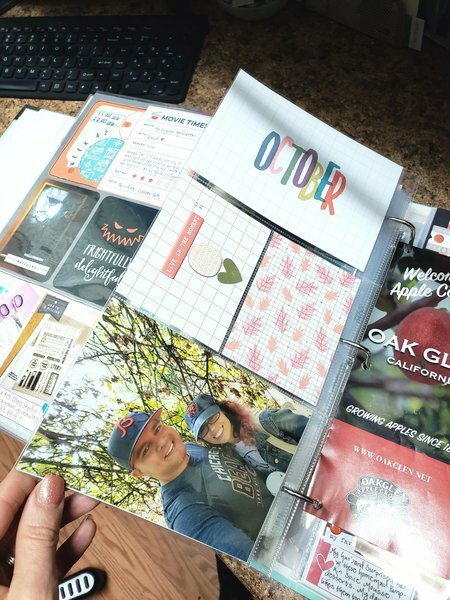 I've already noticed some trends in scrapbooking but I was wondering if anyone has observed trends throughout the years and would like to share them? Goodness. . . that's a million dollar question!!! I've been scrapping since 1998 and the trends have certainly blown the industry wide open. Trends from "making your own labels" to "making your own pearls" come to mind. Then there is the more subtle trends, like sewing normal stitches to "messed up stitches". Chevrons, feathers, and lightbulbs weren't always a part of scrapbooking. Then there is the unmistakable "how to" trend. Shabby Chic, Punk, Cute, Mixed Media, Fussy Cutting, Die Cutting, Traditional . . . etc etc. Trends can be a fun way to learn a new technique, as well as an added expense to your crafting!! Still chuckling...added expense is right with trends. Then there is the trend of recycling anything into your scrapbook. Who would have thought you would use the packaging as part of the finished design. I am embracing the make your own embellishment trend. So many different trends over the years! current trend is definitely mixed media using paints, stains and pastes. Right now I'm noticing, and doing, different sizes and different types of layouts all mixed in one album. Used to be like "This is my 8x10 album. This is my 12x12 album. This is my 5x7 album.... Not anymore! For example - PL Albums that include Traditional PL layouts, Digital PL Layouts, Traditional Paper Layouts, Digital/Traditional Layouts and a mix of different sizes of these. 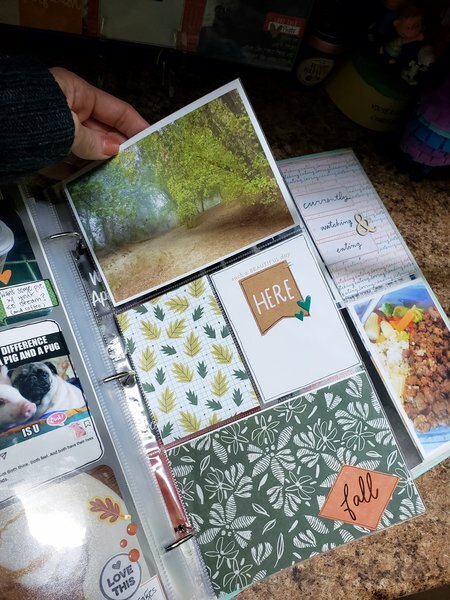 In my 2018 album I have all of the above and page sizes: from 12x12, 8x10, 6x12, 4x12...plus lots of different sized ephemera just hole punched and inserted and it is so fun to flip through. I love seeing others projects that have these different sizes and items in also...makes it so much more fun since you don't know what to expect! Edited by Doreena on 01-13-19 07:33 AM. Reason for edit: No reason given. Doreena, I have not really seen this done but I do think it's a cool idea. I will definitely try it out. I do think it must make it more interesting to look through. Thanks for the tip! I tried digi scrapbooking in 2015. I fell in love with it and never looked back. I even scanned and made my paper layouts digital and put them in Shutterfly books. My kids never had any interest in my paper books - absolutely none and both told me they didn't want them. Went digital and the kids go through them all the time. My youngest son got his AA in design graphics (and is not at Ringling College of Art and Design getting his BFA in Motion Design) and really takes time helping me with different photoshop techniques and we have a great time with the digital together. My oldest son loves the digital books and has told me many times that he wants them some day. He has no interest in the paper. Go figure. The paper is where all the work is - they are a lot more work! I scanned everything, took the paper books and removed all my favorite pages and cut it down to a few albums. The guest house is decorated all tropical and Hawaii so I framed my favorite 22 Hawaii layouts and they are on the wall. I had a lot of layouts with mom and my brothers and nieces and nephews and I made a book for mom with all those. She said thank you, put it away and I've never seen it again. That was in 2015. Then last year I made her a digital 12 x 12 for her 90th birthday and she loves it. It is on the coffee table and she shows everyone who walks in the door. And truth is, I keep planning to go back to paper for some projects but am enjoying the digital way too much. Started a cookbook years ago and got 10 pages done. Want to finish the cookbook but it was for my mom with copies for everyone else. Now I plan to finish it digitally because the paper books are too cumbersome and heavy for mom to handle. She just likes the digital better. And it will be easier to make copies for the family. I'm very happy with the paper pages I did for her book and plan to frame them and hang them around my kitchen and dining room. I guess that is the trend I'm following. I love that I can keep up with my albums a lot better, can have up to 110 pages in a book and its 3/4" to 1" thick, I have 63 books on one shelf, I scanned about 3,000 papers, so I'm using all my patterned paper, I can color match cardstock and even colors in patterned paper to colors in my pictures, I can use button and flowers and papers over and over and over and I never quit learning new processes and techniques. Nothing falls off the pages a year later and best of all, we travel a lot and I can do digi scrapping in hotel rooms while my husband is watching tv, I can do digi scrapping on airplanes and on sea days and after dinner I do pages in our cruise ship cabin. All I need is my computer (internet not necessary) and I have a small portable scanner I travel with. And I love that I don't have to print photos anymore. And I can make the photos any size I want. I find it just as creative as paper scrapbooking, but in a different way. If I want to use punches and traditional paints and things I make splatters on paper or use other medias, I can, then I scan it. In fact I need to make samples of all my punches and scan them. Then I can color them the color I want them to match with one keystroke! I imagine I will follow more trends as far as style (if it is something I really like) but all within the digi realm. Love the ideas and love the contrast in the ways/reasons people do things. I never thought of using different sizes in one book, I don't really even have one complete book done yet lol but they are all 12x12 except the little 6x6 one I'm making my mom for my grandmas pictutes. I can really see how it would make looking through the book more fun for people looking at it. Its interesting to me the reasons behind digital scrapbooking because my entire reason of starting scrapbooks was to preserve my photos physically lol I noticed my mom had a ton of pictures from me growing up then when things started really going digital no pictures got printed out anymore, and it's a scary thought to me of losing them should a technological apocalypse happen lol. Theres a good chunk of time missing in my photos from when I was 12-15 because my mom went digital and doesn't know where all her memory cards are after a move lol. I remember reading an article from a founder of Google who said something like "If you have any photos you cherish, print them out"
A couple more photos of our first Fall 2018 Oak Glen visit. Also if you look at the second photo, glance to the right of the insert and you will see part of an Oak Glen brochure that I hole punched and added directly into to the album. Edited by Doreena on 01-19-19 09:16 AM. Reason for edit: No reason given. When I first started scrapbooking in 2005, the zig-zag scissors were in and cutting photos with these scissors. My first scrapbooks all have these done to the photos. In 2008-2010, it was all about the glitter and stickers. Now, it's more about balance; no glitter and no zig-zag scissors. Doreena, this is a neat idea. Maybe for Happiness Box 2019, I'll do something like this. The animals I noticed the most were the dragonflies - they are still all over everything! I just bought new papers last week and 2 of them have dragonflies! And owls. I bought a lot of owl stuff because I have a granddaughter who loves owls. They really had a great run on owls in everything from scrapbook supplies, clothing and material, statues and everything in-between. Frogs got real popular too. And flamingoes are still very popular. Wonder what the animal of the year will be next year? There is a sloth sanctuary in Costa Rica I want to see if we ever go back so I've been picking up sloth stuff. Have 2 or 3 cute papers. Okay, I never did think of the animals as part of the trends but holy cow, do I see it now! I agree with the animal trend but never really paid attention to it. For me . . . it's bears all the way. Every time I want to make a paper piece animal . . . I reach for my bears nearly every time. I can't seem to make sloths look cute. I love llamas and sloths so I'm excited about this phase! I love mini-pigs too, naturally because I have one, but they don't have much out for them. Crossing my fingers that because it's the Year of the Pig that I will see more piggy stuff! And cats and dogs will NEVER go out of style! Edited by Doreena on 01-21-19 06:41 AM. Reason for edit: No reason given. Happy you found the info useful! so many trends in different year's. One thing I notice with my layouts - I've gone to more journaling and more memorabilia. I also now give each book a name and title page. For trips and cruises, I also go with themes now which I never used to do. I just backed up my computer twice. Usually do it on Friday nights but just got around to it. Have 2 back up externals, one which stays with me in my backpack where ever I go - 1 T and I back up all pictures and documents every Friday night. Also on Friday nights, I back up a second 1 T backup to keep in our fireproof safe. I don't back up on SD cards- too easily lost and the same with flash drives. I use an external and one is in a case in my backpack and one in my safe. When we were in Buenos Aires a few years ago a man was at La Recolet (Sp) taking pictures because he lost all his pictures when he was there a few years earlier - they were on SD cards which fell out of an envelope. On another cruise a passenger had filled 6 SD cards and lost all of them - had no pictures from the 4 months world cruise so I shared mine. I seldom print one out - only if it for my mother or for a gift. Other than that they are digitally safe. I hate what time does to printed pictures. They fade, yellow and discolor. They don't stay nice and are a pain to restore, if they can be restored. I wish all our family pictures from the 70's had been store digitally so the color would still be maintained. I know at least 5 or 6 people from churches I've belonged to who lost all their pictures to fires around the country and I can't count the number who have lost their photos all to flooding, hurricane and tornados. If we had a big disaster I would not be able to grab any of my photos to escape, but could most likely grab my backpack this is 3 feet from me now or come back and get my other external out of my safe later if I didn't have my backpack with that external. I had one computer teacher who told us to have two backups - one we can get to easily, even have in our purses or backpacks and to keep the other one at a friend or relative's house. He said in his safe he has his mothers and brother and sisters externals, his mother had his. He said he backs his up all the time to keep with him and once a month he gets his external form his mother and back it up and gives it back to his mother. When we travel, my external goes in my backpack, my computer goes in my carry on. (The other is home in my safe). IF something happens to my backpack with the external or my carry on with the computer, I haven't lost any pictures. I also back them up every night from my camera when we travel. I never leave them on the camera - one of my friends was in after about 2 months on the ship, a rogue wave hit her and destroyed her camera and she lost 2 months worth of vacation pictures. They could not be retrieved from the wet camera. Even the scrapbooks I made with paper and trimmer are scanned digitally and stored on my externals so if something happened to my scrapbooks, I can order them again. I have every page of all 63 of my scrapbooks on my computer and on my 2 back up externals. I really do feel my photos are safer on my computer and 2 externals. A few years ago I went through my mothers photos - 8 big boxes and spent 2 full days with my portable scanner and scanned every photo she has that I could possibly want. Then she told me she was leaving her photos to me and I asked her please not to - I scanned hundreds of them and what I didn't scan, I didn't want. Neither of my brothers want any of mom's original photos - said if they did, they would get them from me and print them out. Bottom line - no one wants her 8 boxes of photos. My oldest son wants my digital scrapbook but neither want my paper scrapbooks (especially since I scanned all the pages and had them printed in a book) and neither want any of my loose photos. Its a dilemma. One of my girlfriend's husband inherited 6 huge boxes of his mothers photos - took up a corner of their guest bedroom. He didn't want them - she didn't want them and he has no siblings. FInally, my friend forced him to go through them picture by picture, identify the people they could or toss them out. Then they took those pictures and made a different picture album for all the grandkids of their grandparents and the rest - the marched to the dumpster. She said the vast majority, no one could identify the people or places. I really do not believe my kids will keep my externals with all my pictures on them, but I do believe the digital books will be kept. I think one trend I'm seeing for both paper and digi scrappers is to journal and explain things more so future generations who inherit the books will know what it is about and who the people are and the story. For so long pages were made without the stories, and the stories are usually the best part and what the kids and family's want to see the most. When my kids go thorugh my books, they read every word because they want the stories behind the pictures, not just pictures mounted attractively. They want to know more about the picture. So I see two trends going on. One with the really creative, talented people who are very artistic and want to enjoy that side of scrapbooking - making something beautiful. And the other trend for people who are documenting memories - I see them (I'm in that group) journaling more and using more memorabilia to remember the story. Yes! I just have to remember this in 2020, because I'll open Happiness Box 2019 on 1-1-20. Maybe for some travel books I'll use this format too. You are so right!!! I do back up my photos constantly. I have made digital books in the past and I must admit it is so much easier to really see and know what happened (trips and so on) than to make a bunch of pages. I too have loose photos lying around all over the place and it's like . . . . what was I thinking? But I create for the love of creating. It sometimes takes me over two days to actually make something start to finish. There is genuinely a magical unicorn feeling about starting with a blank canvas and coming up with an art piece that I love . . . . and others too. So, scrapbooking is really about "what do I want to do"? It can be another art form, or it can be about your life. It can be both. Do what you love and what makes you happy! Exactly Vivian - it can be both. I'm not artistic or creative so mine are just documenting memories but there are some scrapbookers who are so talented and do an awesome job of documenting their treasured memories and making a gorgeous piece of artwork at the same time. My style is more graphic designer style. If I try to do a really artistic piece, I just make a mess! There are always trends in everything and they change or evolve over time. Not everyone is eager to follow trends, but perhaps we can be inspired by them without actually using them. Edited by jamesandersonicb on 01-29-19 01:02 PM. Reason for edit: No reason given. I think so. I have bought owl paper but it is because my granddaughter loves owls. I've also bought sloth papers because we end up in Costa Rica from time to time for cruise ship ports and there is a sloth sanctuary I want to visit. Most everything I buy - there is use for it now or later. I've noticed that mats are getting thinner and I like that trend and will do some with thinner mats. I also noticed a trend not to use mats at all. I never though I'd do a page without mats on every picture but I've done a few and I like it. If I really love a trend and it fits the style for what I'm doing, I may try it. But I don't go after anything just because it is a trend. That isn't me at all.